With no intrepid souls wanting to follow me into the chasm of madness that is suction downforce, I needed to find a kinder, gentler path to the banned technology award. Preferably one that didn't involve an extra motor and a 100lb fan. The solution? A giant wing. A fully loaded Cessna 172 weighs about the same as a Civic and travels at similar speeds depending on which way the wind is blowing. A chunk of Cessna wing should be able to produce some serious downforce if turned upside-down on the roof of the car. Thanks NASA, for making FoilSim available. I used the camber and cord thickness from the Cessna wing (it's a NACA 2412 profile) and plugged them in. At 65 mph and 15 degrees, the angle of maximum downforce, we get over 1000 lb! 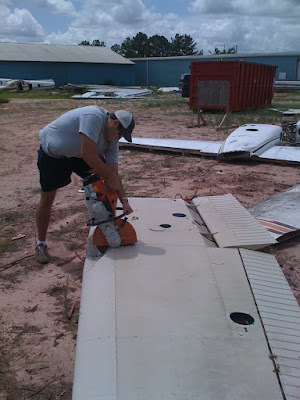 A trip to the local aircraft salvage produced a 6ft chunk of 172 wing with just a few dings. It even came with a flap. A special thanks is in order to John and Blake at Atlanta Air Exchange for helping us out with our insanity.